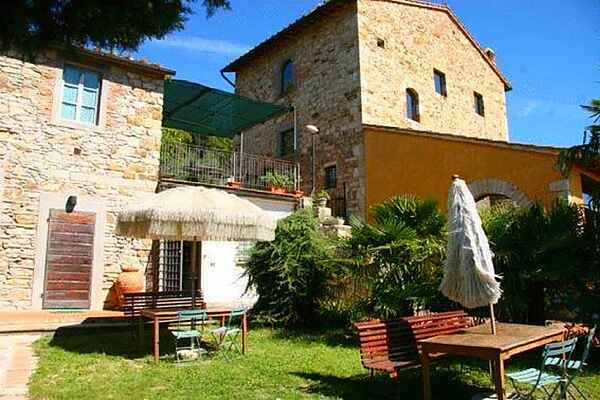 This beautifull pearl of Tuscany is situated on a picturesque location in the Nature Park of Mount Morello. Behind the house you look out to a field full of cypresses that go around all the land where they are surrounded by Alberese rocks. All the land is filled olive trees, and family Palchetti pushes through the tradition of the oil making actually making one of the best oils in Tuscany. About 5 hectares around this area have been kept well preserved, always making sure it would keep it's natural appearance of local products (fruit trees, herbs, vegetables of the vegetable garden), from an explosion of poppies with yellow marigolds, purple anemones and the irises, tulips along the edges of the walls. Before doing ANYthing ... This place is definitely the place to relax, in the middle of the countryside with olive trees, flowers, colours and scents that will accompany you while enjoying the bath in the pool under the sun. After this great doing nothing......... look at the advice of the owner! We propose; WINE AND OIL TASTING TOUR DIRECT SALES OF WINE, AND HANDMADE OIL PRODUCTS BREAKFAST BASKET WINE TASTING AT SUNSET COOKING CLASSES TYPICAL DINNER WITH PERSONAL CHEF INTERNET POINT NATURE TRAILS MOUNTAIN BIKE SHUTTLE SERVICE - TAXI ORGANIZATION OF EVENTS AND COLLECTIVE ART The area has to offer: Guided tours by mountain bike Trekking - exploring the Natural Park of Monte Morelloattraverso and its paths Trekking with a donkey ... Visits to the Park of Neto where you can see thousands of flowers, the rare swamp cypresses, poplars of Canada and its ponds crowded with animals and birds.